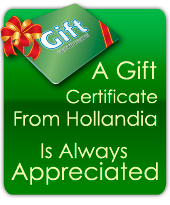 Hollandia Gift & Garden is our newest location, conveniently located on Stony Hill Rd, between exits 8 & 9 on I-84. This is where you’ll find a complete center for outdoor living including luxury outdoor furniture, Weber grills, masonry, statuary, bird houses, lawn torches, gifts, and of course, the best plants available in Fairfield County. We pretty much have everything you need to nurture your lawns and gardens. As you have come to expect from Hollandia, everything sold in our store is top quality.